When the judges’ decisions during were announced you have heard people squeaking for joy, others were dazzled by the frenzy of lashing cameras during the championships. Why are National Championships so special? It is not only a validation; it is also a shared experience and a celebration that numerous Arabian horse breeders, owners, and enthusiasts enjoyed at the Abu Dhabi Equestrian Club. The club is not only the home of horse racing in the capital with around 16 race meetings a year. 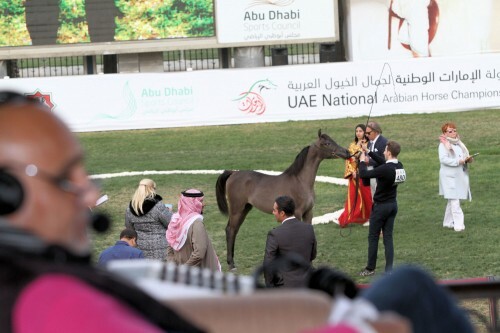 It also opened its doors for the UAE National Championship, which meant amazing six days of shows and around 700 Arabian horses paraded in front of an international judges panel. The show saw two different kinds of championships, the UAE National and the UAE National Local. Every first and second horse in each class qualified for the UAE National Championship. Third and fourth place, provided a Sheikh does not own them, compete in the UAE National Championship Local, a great way for the Emirates Arabian Horse Society (EAHS) to support smaller breeders. A lovely bay Kanz Al Bidayer daughter accomplished Gold Champion Yearling Filly Local: Mai Al Hawajer, bred and owned by Dr. Ghanem Alhajri. Her dam Abby Gale LBA is by Da Vinci FM, representing the valuable Versace sire line. Another bay filly, this time bred and owned by Al Bustan Stables, garnered Gold Champion Junior Filly Local: Fareedat Al Bustan. Her sire is RFI Farid and the dam JJ Mona Lisa is a well-known Magnum Psyche daughter. Jamal Khamis Abdelrahman Murad Almaazmi is the proud owner and breeder of Gold Champion Yearling Colt Local. The bay Fam Al Khamis is by D Mashary out of D Jareen, by Royal Colours, representing mainly Polish and Russian lines on the female side of his pedigree. The winner of the Gold Champion Junior Colt Local represents an aristocratic pedigree. Battal Alzobair is a son of two outstanding bays, sired by Marwan Al Shaqab and his dam is the breathtaking Donna Molta Bella SRA. Bred by Al Zobair Stud, the colt is now owned by Al Jazeera Arabian Horse Stud. An aristocratic pedigree? This is true for Azalea LBA, too, who is not only an amazing Show mare but also a daughter of World Champion and U.S. National Champion Stallion Marwan Al Shaqab and U.S. National Champion Mare Amelia B. Azalea LBA is a beautiful chestnut and the Gold Champion Senior Mare Local suits her just well, much to the delight of her breeder Beverly Halquist, USA, and the owner, Al Saqran Arabian Horse Stud. It was another bay, which accomplished Gold Champion Senior Stallion Local. The AJ Portofino son AJ Najran, bred by Ajman Stud and owned by Al Tayar Arabian Horse Stud, is out of Nowarat Al Khalediah, by Marwan Al Shaqab. Dubai Arabian Horse Stud garnered both Yearling Championships National. Gold Champion Yearling Filly National was D Shihanah. This grey filly is linebred to Marwan Al Shaqab through her sire FA El Rasheem and her grey dam D Shahla, by Marajj. D Shihanah’s stablemate D Mahboob was the unanimous vote of the judges for Gold Champion Yearling Colt National. The D Mshary son (Marwan Al Shaqab sire line, too) out of Julianna Z, by TF Psymreekhe recently won Gold Champion Yearling Colt in Fujairah four weeks earlier. In addition, the magnificent breeding program of Dubai Arabian Horse Stud also bred Bronze Champion Junior Filly National, D Masah, and Bronze Champion Senior Mare National, D Reem. The dark grey Juri Al Bidayer, by Marwan Al Shaqab out of HS Jumanah, by Gai Radiant, accomplished Gold Champion Junior Filly National for her proud breeder and owner Al Bidayer Stud. Another successful grey from the same excellent breeding program was Sinmar Al Bidayer, by Shanghai EA, who won Silver Champion Yearling Colt National. Last but not least, it was Masroor Albidayer winning Gold Champion Senior Stallion National. Masroor is by AJ Dinar (representing the WH Justice – Padrons Psyche sire line) and out of Mayasah Albidayer, by Marajj, herself a daughter of the amazing producer Mattaharii. 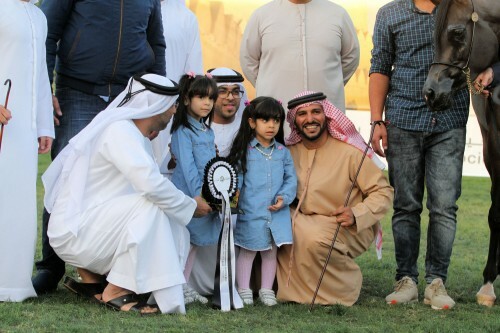 Dr. Ghanem Alhajri celebrated a one-two-success as a breeder in the Yearling Colt Championship. Gold Champion Colt National went to Shahwan Al Hawajer (owned by Ajman Stud) with his paternal half-brother Mahboob Al Hawajer, by FA El Rasheem, winning Silver. Another FA El Rasheem colt bred by Dr. Ghanem Alhajri brought home Bronze Champion Yearling Colt National, Radad Al Hawajer. The Senior Mare Championship saw a gorgeous string of pearls. The judges’ cards saw the magnificent bay Gazal Al Shaqab daughter Pistoria first, winning Gold Champion Senior Mare National. Pistoria, out of Palmira, by Monogramm and back to Palestra, is an already accomplished show mare winning prestigious titles in Europe in the past. Bred in Michalow, Poland, this beauty was sold at the 2015 Pride Of Poland Sale to Sheikh Abdulla Bin Mohammed Ali Al Thani. While aforementioned D Reem won Bronze, Silver was awarded to AJ Aryana, bred and owned by Ajman Stud. Another highly elegant bay AJ Portofino get this time out of Straight Egyptian bred MC Alexis, by The Elixier. Congratulations to all of the competitors and a very sincere thank you to the fantastic support of the organizing team of the Emirates Arabian Horse Society, especially Mr. Essam Abdulla. Arabian Horse Global Network would like to extend our thanks for the excellent collaboration.